The president's December 2011 Christmas gift to his daughters skyrocketed awareness of the game, according to Ubisoft's managing director. What's proof of a product's mass market appeal? If you're Ubisoft, the answer is a purchase from the leader of the United States. 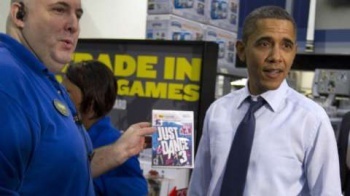 President Obama bought a copy of Just Dance 3 for the Wii from a local Best Buy in December of 2011 as a gift for his daughters, and the ensuing PR from the buy helped catapult mainstream recognition of the franchise, according to Ubisoft managing director Xavier Poix. "We got so many phone calls that day," Poix said in an interview with IGN. "My first thought was that our PR in the U.S. must be really good, but no, I was thinking: now we're universal. The image that we wanted to convey with the game, the spirit of it, really worked. The president, in front of 80 cameras, can think, 'I'm not making a mistake in showing that I love this game.' It is so simple and positive that nobody could object. We're very proud of that." The Wii version of the latest edition of the franchise, Just Dance 2014, was one of Amazon's best selling games this past holiday season, so the popularity of the franchise has clearly endured. Just Dance 2014 is also available on Wii U, PS3, PS4, Xbox 360 and Xbox One.